A Bay window is a window that protrudes outside the exterior wall of the home. They provide a wider side view of the exterior of the home. These are made of multiple casement or hung windows. They are joined together with a coupler at degrees of 90, 135, and 150 degrees. Custom angles are also available. A bow window is essentially a curved bay window. Bow windows are designed to install out the exterior wall of a home and allow for a Panoramic view of the exterior of the home. 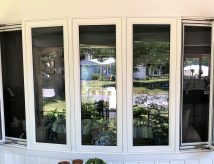 Bow Windows are made from Multiple casement or hung windows that are installed side by side and joined with a coupler to match the degree of the bow. The bay and bow windows add light and space to your interior while giving a luxurious look to the exterior of your home. With their casement or hung openings, they adapt to the particular style of each home. Materials – Vinyl, Wood, Wood and Vinyl Hibrid, Wood and Aluminum Hybrid. Contour Series Vinyl Windows Come with Industry Leading Lifetime Parts and Labour Warranty. Exterior colours: 24 Standard Colour Options and Computer Matched Custom Colours Available.